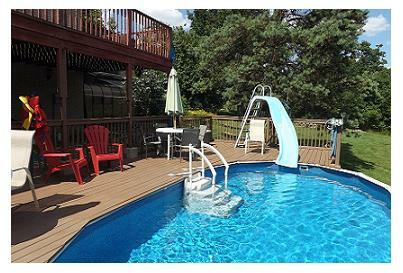 The Swimming Pool and Jacuzzi Hot Tub are right outside your bedroom door! 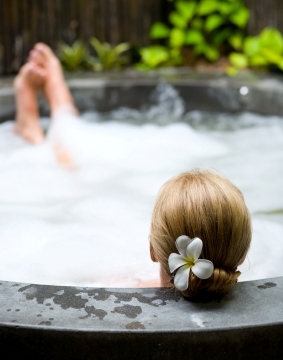 Enjoy the hot tub any time, summer or winter - my favourite time is in the winter in the moon-light! 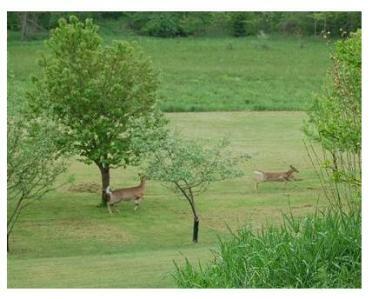 Two White Tailed Deer in the orchard - deer visit almost daily! "Wonderful - we just spent our fifth stay at the holiday home and we enjoyed ourselves very much - a mother deer and her twin fawns strolled through the garden each morning! We'll be back!" 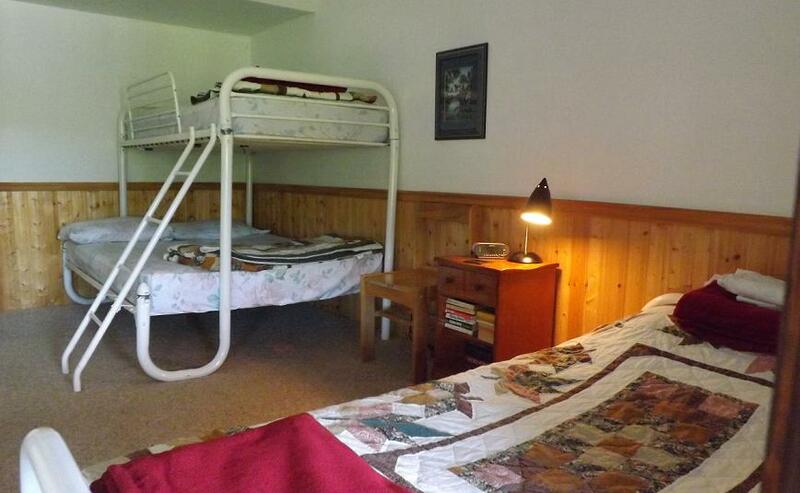 "Perfect for the Family" "My husband, myself and our 4 kids stayed there for a snowed in weekend this past winter. We didn't let being 'snowed in' stop us from our family time. All 6 of us enjoyed the property exploring, the goats and the hottub. The homemade bread was an amazing welcome and the owners were so friendly and not too invading. The perfect hosts! This is why we are returning to experience a summer weekend away from the city. We are looking forward to fishing the river, swimming in the pool, Port Stanley Beach as well as the Hot tub and the baked bread! We all enjoyed playing games by the fire inside and look forward to be an annual 'repeat customer' before the kids get too old to want to go. Although, I know my husband and I would enjoy this place for some 'alone time' as well! Looking forward to returning this summer! "My husband and I, and our teenage daughter and son, stayed at the holiday home in July 2012 and the whole family had a really nice time. The accommodation was really large, spacious, very clean and most of all there was so many extra touches to make you feel comfortable. It took me all week to read the interesting books and magazines and there was plenty of DVDs and satellite TV for entertainment. The hosts were very warm, kind and friendly and went out of their way to make sure that we were comfortable. We were so close to St. Thomas and our teenagers were able to go to Swiss Chalet for dinner. The Port Stanley Beach was awesome and an easy drive. The family had a new kitten when we arrived and we fell in love with it and all the goats and the two baby roosters were so cute. There is a lovely river view walk on the property and you can fish there. The pool and hot tub were so relaxing and I would have to say that this vacation has something to suit the needs of all age groups. We haven't stopped talking about how good it was since we came back!" "Absolutely fantastic place to stay, every need was met. Set in acres of grounds to stroll around and view outstanding scenery, full of loads of wildlife, lovely walks nearby and plenty of beautiful parks and shops just a short drive away. I would highly recommend this holiday home for a family or couples old and young. With a hot-tub and swimming pool there is plenty to do whatever the weather. Excellent holiday with very hospitable owners. We have never met such nice people! We had the best holiday ever!" The holiday home was just perfect and really was so well stocked with everything one would need for a stay. The property was just as you described it in your web site, even down to the deer visits and five of them graced us with a long visit on our last night. I would be happy to recommend your delightful accommodation to others! 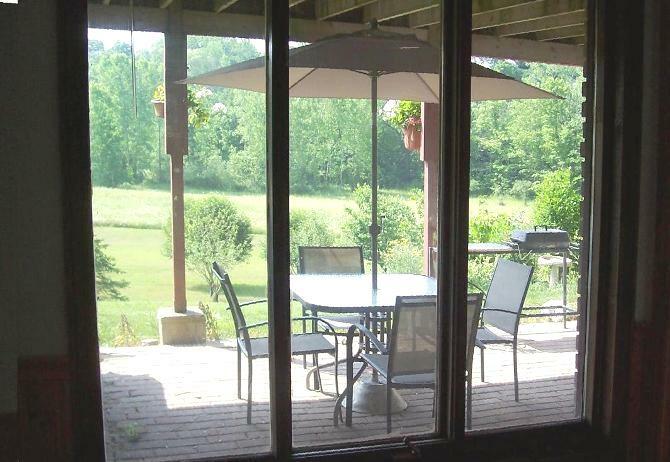 "My family, complete with 4 children, had a fantastic and very comfortable week at Sunnybrook Farm in November 2010, and highly recommend it. It is in a peaceful country location, well away from busy roads, our hosts were kind and considerate. All in all, I cannot praise Sunnybrook and our Hosts enough. 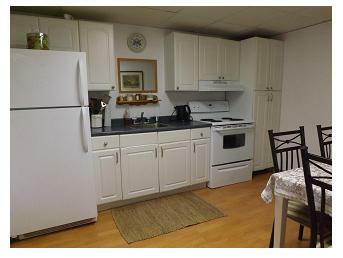 I would definitely recommend this lovely apartment. Five stars all the way!" 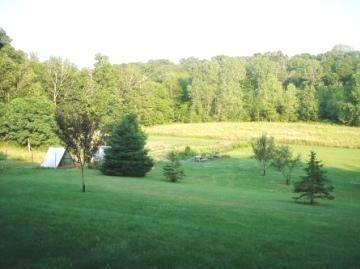 "Our family had a wonderful time at Sunnybrook Farm in August 2011. We spent 9 fun-filled days; shopping in London & St. Thomas and enjoying the beautiful beach & scenic train ride in Port Stanley. In the evenings we were able to relax in the hot tub and pool...wonderful! The suite was clean and comfortable, the grounds beautiful and the hosts awesome. 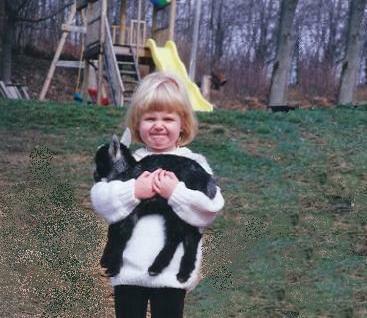 The goats were an added bonus, especially for our 3 year old who chased them all over the grounds. 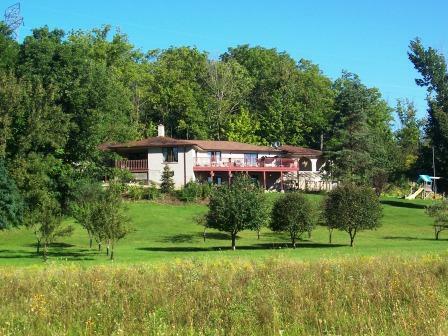 We highly recommend Sunnybrook Farm...we all had an incredible time"
"Wonderful Holiday Home! 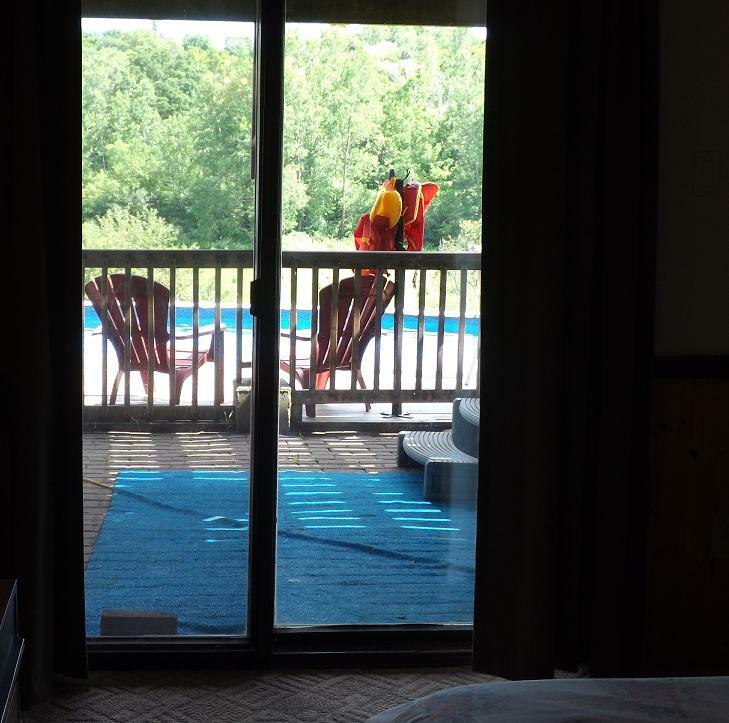 - My Mom and I wanted a short term getaway that was close to nature, peaceful, and economical. 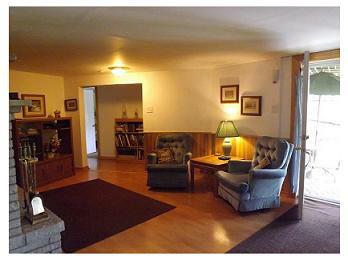 We sure found it with Sunnybrook Holiday Home in April 2012! 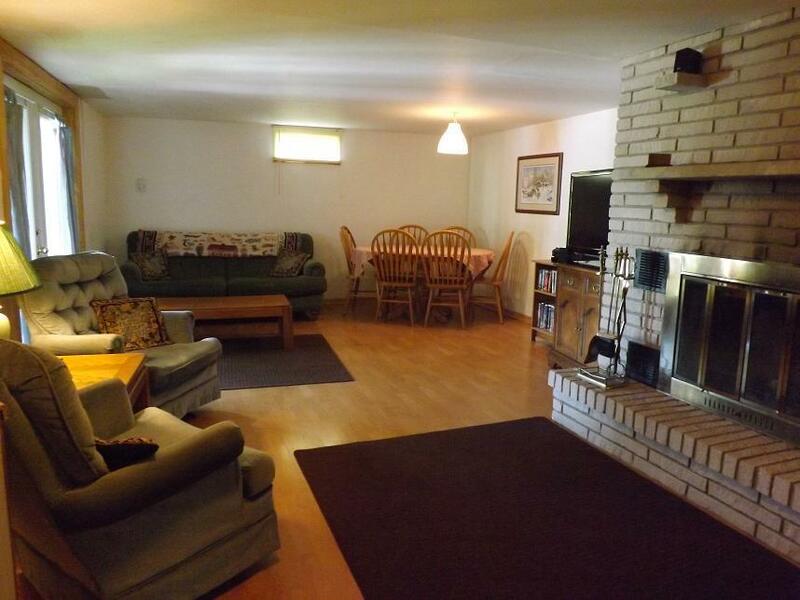 The home was quaint and spacious with lots of extras that most getaway homes do not provide. It backed on to acres of beautiful trees and forest with a river running through it. They had an adorable hobby farm with goats and free range chickens ( I got to hold one which was really sweet!) We saw a family of deer on the property in the a.m.,and saw lots of beautiful birds. Close by they directed us to more trails where we went bird watching and discovered all kinds of wildlife! Our hosts were the most caring considerate people we have ever met when staying away from home.They even baked us fresh homemade bread of our choice, and cinnamon rolls which were delicious! While our hosts were extremely hospitable and friendly, they also provided us with the privacy we needed.After a long day of hiking on the trails we relaxed in their amazing hot tub! Highly Recommended!! We will be back in the Fall! 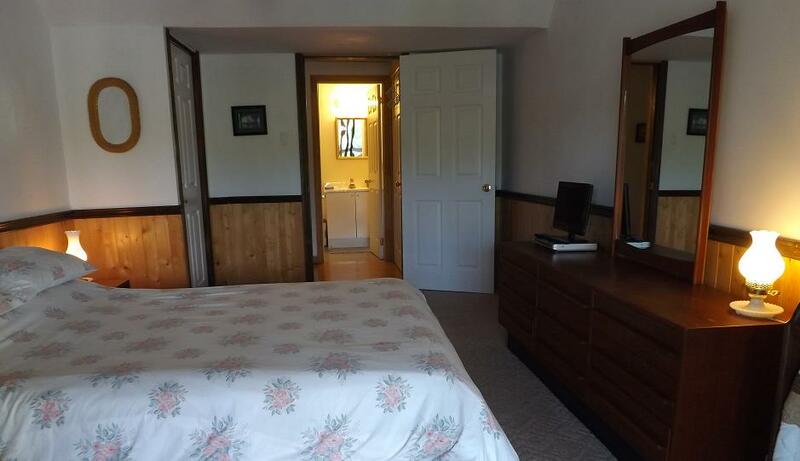 Sunnybrook Farm is the perfect spot for a relaxing family vacation. We rented the apartment for my daughter's fourteenth birthday celebration. She had six friends over for a dinner party and they made great use of the swimming pool and hot tub, the barbecue, and the nature trails. After dinner they enjoyed the DVDs, wifi, and the campfire. They really appreciated the privacy and being away from siblings and chores. The master bedroom provided the perfect retreat for me to relax while giving the girls the run of the apartment. For breakfast we enjoyed farm-fresh eggs. It was fun to explore the grounds, watch the hens and interact with the goats that roam the property. My son enjoyed watching the release of the wedding doves for a training session in the field. The hosts were wonderful and went above and beyond in many ways to ensure that we had an interesting and comfortable vacation.. Overall, it was a perfect weekend and we are already looking forward to a return visit to Sunnybrook next month!